Overall, Yamaha YDP103R offers a great experience for advanced pianists and will surely offer as good a leaning experience for beginners. One of the digital pianos we haven’t reviewed yet is the Yamaha YDP103R. We decided to take a closer look at this instrument, to understand what it brings to the table and why it’s so appreciated by both beginning and more advanced pianists. The keyboard provides for a heavier touch in the low end as well as a lighter touch in the high end of the piano. The system is similar to that which is found inside an acoustic piano. 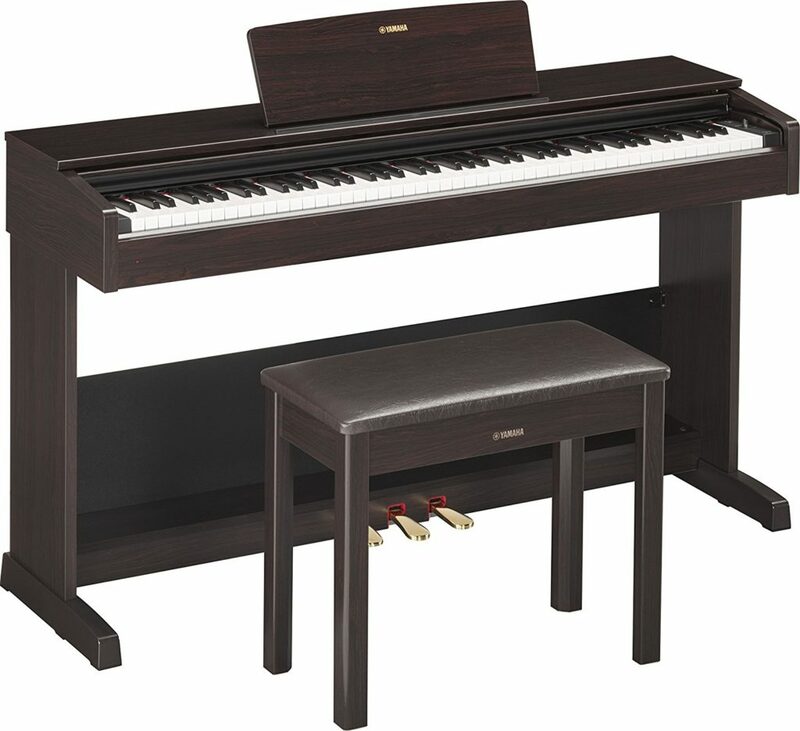 Yamaha YDP103R is a very attractive option, especially if you are a piano beginner. Practicing with a graded hammer standard (GHS) helps you to build up that necessary finger technique for playing on acoustic pianos. The matte finish on the black keys of the piano is also a great advantage to the starter pianist as it makes them less slippery when playing for quite some extended periods of time. It has also been designed to absorb moisture as well as remaining tactile after extended use without becoming slippery at all. The piano has an advanced wave memory stereo sampling which has been designed with the ability to recreate natural instrument sound in the stereo mode. The controller App, which has been optimized for connection with iOS devices, has a very rich graphical user interface, thus allowing for a quick and also easy navigation of the piano settings. Through the app, you’re able to adjust settings, choose voices and also record performances. Yamaha YDP103R also has a dual mode that will let you combine the two voices produced together, like piano and strings, for an inspiring new piano and keyboard playing experience. The Yamaha YDP103R has some really improved sound qualities. It has made strong improvement on the traditional AWM that is the advanced wave memory synthesis. This kind of technology is one which is highly used by Yamaha in delivering the real piano sound to the keyboard. The advance wave memory is one that uses digital recordings of sources which include the actual instruments. This allows you to be the greatest enjoyment of the grand piano reverberation, at whichever location you are playing your piano from. The Yamaha YDP103R has been manufactured with the ability to make you easily connect and interact with your instrument. A standard USB cable can therefore be conveniently used to connect the instrument with a computer or with a mobile device. This is a feature that has not been so common with pianos. It has brought along a world of creativity in the Yamaha models, offering entertainment, as well as education. There are so many advantages that come from being able to connect your mobile devices to the instrument with such ease. This opens up a whole new world of ways in which you can use your musical instrument. The piano has a power adapter and a stand as well as a bench included. Overall, Yamaha YDP103R offers a great experience for advanced pianists and will surely offer as good a leaning experience for beginners. The high user rating on Amazon as of this review, of 4.4 over 136 customer rating is clearly understandable.